Apart from the features of CRM Software, R Plus CRM has some unique and special features which will help you o improve the productivity, communication and team work. Work on multiple tabs is a special feature of RPlus CRM which is not available in the market. In any web based application or website if you open a page you will not be able to keep the previous page open. Suppose you are in view customer page and searching for some client list, at the same time you got a lead and needs to be entered now. If you do not have tab facility then you might need to click on New Lead page and whatever you have searched in view client is gone. To keep may features open RPlus CRM has introduced a features called Work on multiple tabs, using this you can able to work in multiple modules without closing any module. This will save user's time a lot. Also working on one tab will not affect the other tabs. Each tab will have a refresh button to refresh the current tab. If you refresh the page by click on refresh in the browser then the software will remove all the tabs and go to initial stage. In this above example we have opened Home,Add Enquiry,View Enquiry,View Client,View Contacts. Add Enquiry page is open now, at this moment if you want to see the client list then no need to go to view client page, just click on View Client tab which is already opened and it will not refresh the page. If you press Esc button the tab will get closed. Whenever we fill a form there might have some fields which comes from master modules. For example City, we put all the city list in the master at the initial stage. If the city field is there in any module then the data comes from the master. Suppose you are on Enquiry page and wants to add an enquiry, but in case if the city is not available then we have to close the current form and go to City master and add the city. Then only you can come to add enquiry page to add that enquiry for the same city. In RPlus CRM you don't need to go to master page to add any master data, you can add the master data from any page. As per the above screenshot, the product Hard Disk is not there in the product so just enter the name and click on Quick Add this will add this product in product master. 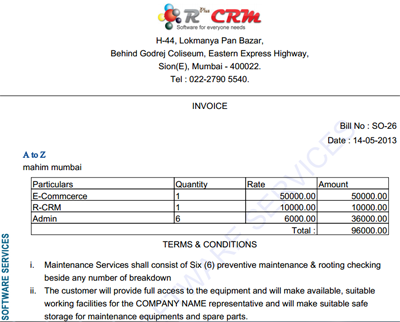 In quotation or invoice, you can customize as per your business requirement. In the quotation there would be your logo on top, below that your company address which can be modified in settings. 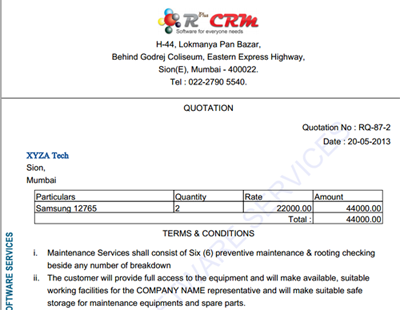 Also there is a watermark text over the quotation or invoice, you can modify the water mark text in setting. This will make sure that your contract or invoice is secure. If you do not required then keep the watermark text as blank. You can export any data like client, enquiry, opportunity etc to excel sheet. This feature is available in all the modules. Search feature is available in all the modules. There would be a search by dropdown to select in which column you want to search. This search by option can be setup in the configuration. We understand the customer's valuable time and we do not want anybody to search for a feature. All the features are available in front of you, like main menu on top shows the main modules. You can click on that and go to the sub modules. Now here you can customize the menu sequence or name also. As per your wish you can rename or change the sequence of main or sub menus. And if you go to any page you do not need to worry about any other module, because we have quick add and auto complete feature which will help you to do the work faster. Sorting feature is available in all the columns of all the modules. You can sort the data by Ascending or Descending order of any column by clicking on the column title. View, Reports, Summary are available in all the modules but it will be in a format of content. For example I want to know the list of Campaigns with the leads I got from each campaign. Now for this case we can have a report which will tell you the list of Campaigns with leads but it would be in a form of text and grid. This required more time to understand but if we have the entire summary in the form of pie chart or bar chart then it will not take time to understand the business position. Task and activity is a plugin feature which you can have it in any feature. You can set a reminder from any page where activity plugin is available. Once the time crosses the given time it will alert you.